--- Please Select --- 7'2 x 22.5" x 2.75"
When the waves are drained out and mushy, you'll need a surfboard that can catch just about anything. And while longboards are great, something lighter and more maneuverable can be even more fun. That's why we developed the Soulr Bottlenose… it'll catch waves that only a dolphin could ride! The nose of this board is very fat and it starts with a deep, single concave on the bottom. This gives the board Excellent planing abilities, and lets you put more weight on the nose when paddling. By moving your weight forward, the Bottlenose will speed up very quickly, allowing you to catch even the mushiest of waves. And once your up, you can easily glide down the line and burn through faster sections. You'll also enjoy the feel of the rounded pintail, as it smoothes your turns and rail-to-rail transitions. 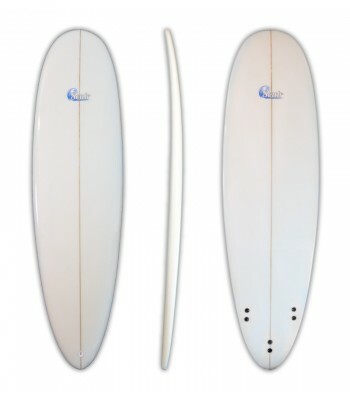 Length 7'2 x 22.5" x 2.75"